AP EAMCET 2017 Answer Key: APSCHE Answer Keys 2017 released a few hours ago. Do Download the Andhra Pradesh EAMCET Answer Key 2017 right now using the link the in post. One of the most prestigious institutes in entire India, Andhra Pradesh State Council of Higher Education (APSCHE) finally came up with EAMCET 2017 Answer Key for students appeared in the examinations this year. This solution was released for recently held test in various centers. APSCHE have recently conducted Computer-based Engineering Agricultural and Medical Common Entrance Test on 24th, 25th, 26th, and 28th April 2017 whose answer keys were released late yesterday by the institute. Go ahead and download the official keys. The institute is apex body to conduct various entrance tests for students in the state of Andhra Pradesh. Many students seeking admission in engineering and agricultural courses appeared in the examinations last year, whose result is now released by the institute. You can now download the EAMCET 2017 Answer Keys for the entrance tests candidates from the links below. This examination Conducted by JNTU Kakinada on behalf of APSCHE. Since there were a different set of papers for the students took the examination at different time slots, a separate list is prepared for all type of candidates appearing in the examinations. So far institute has only released the 2017 EAMCET answer keys for first 3 days of examinations. The key for the exam conducted on 28th of April is expected to release by 1st May 2017. 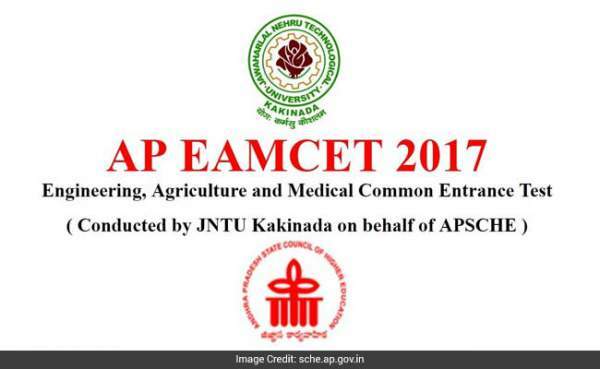 Jawaharlal Nehru Technological University Kakinada conducted the EAMCET exam on behalf of APSCHE. Many students from different part of the state appeared in the examinations seeking admissions in B Tech and allied courses. Institute also gives some time to students having an objection with the answer keys released by them. Students having objection can submit forms before 2nd May 2017 only and the result of same will be declared on 5th May 2017. The majority of students usually appears in the engineering courses examinations which usually suffers a higher turnout ratio in comparison to the other ones. Around 2 Lakh students appeared for Engineering course this year while another 80,000 students are appearing for Agricultural courses. Exams were conducted on 24, 25, 26 and 28 April 2017 this year. Here are the direct links to download answers in .pdf format. As the exam was conducted in 2 shifts, keys are also divided into the Morning and Afternoon sessions. Download the appropriate version of Answer Keys from the official website only and compare it with your answers. It’s quite simple to predict your rank in AP EAMCET examinations accordingly. TheReporterTimes.com wishes students the best luck for their examinations. Previous articleBaahubali 2 1st Day Box Office Collection: Bahubali Opening Friday Report UNTHINKABLE!